This title was first published in 2003.This book explores many of the major issues of concern to researchers studying trade unionism. It offers: a definition, elaboration and contextualisation of militancy (industrial, union and worker); an examination of the relationship between workplace unionism and the wider body of the union; a study of factionalism and industrial and political consciousness: and an analysis of the construction and mobilisation of conflict and cooperation (social partnership). 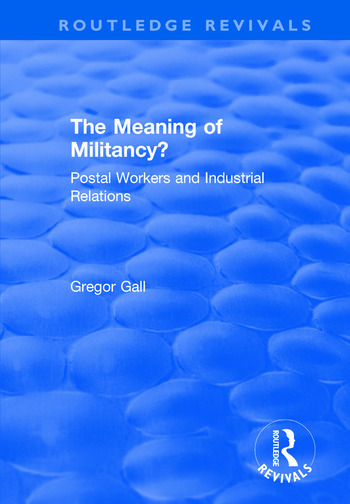 These themes are considered through examining the relatively militant response of British postal workers to increased commercialisation of their industry. By comparing this response to that of postal workers in nine other major industrial countries, the study provides an explanation of why UK postal workers have been relatively successful in resisting new management techniques and privatisation through militancy and oppositionalism. One aspect given particular attention is the uneasy relationship within the postal workers' union between shop floor militancy and the social partnership approach followed by the union's leadership. Contents: Introduction; Worker militancy, trade unionism and industrial relations; Royal Mail's business, industrial and political environments; Strikes in Royal Mail: volumes and trends; The 1988 national postal strike; The 1996 national postal strike; Strike propensity and strike potency; Strike organisation and strike characteristics; The politics and consciousness of postal workers; Assessing militancy; Comparative positions and processes; Conclusion; Postscript; Appendices; References; Index.